How do you find your faucet stem or handle? It's easy to narrow it down to a few choices. Simply count the number of splines on the broach. 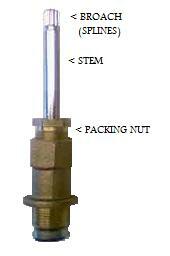 Once you have that number you can locate your stem or handle by spline count and comparing the picture. 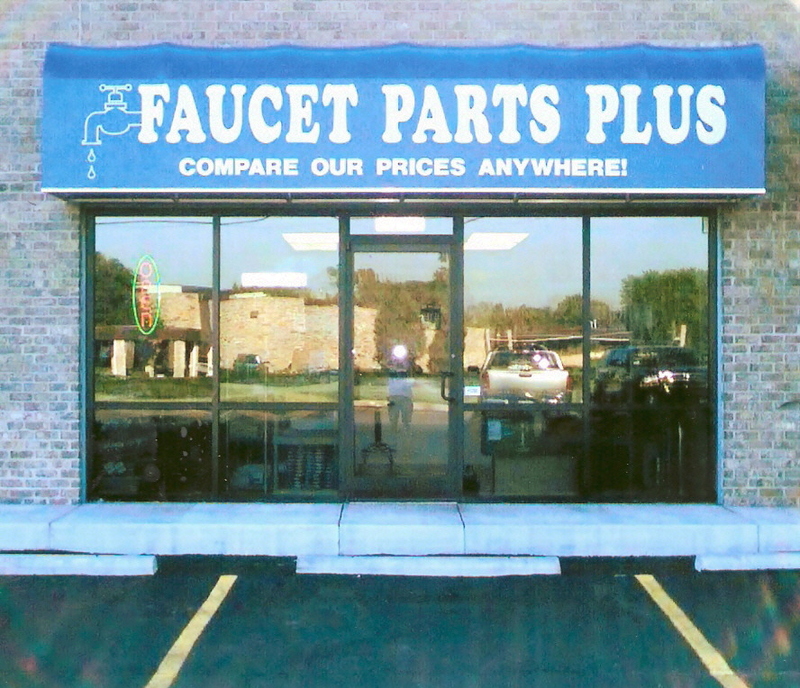 If you still can't find the part your looking for then, Just e-mail a photo of the part to faucetpartsplus@gmail.com . 12 point .335" broach - Crane Dialeze, Michigan Brass, Wolverine. 12 point .375" broach - Arrowhead, Artistic Brass, Harcraft, Glauber, Price Pfister, Scoville, Universal Brass. 12 point .39" broach - Bradley, Elkay, Fisher, Sears, Universal Rundle. 12 point .415" broach - Symmons. 12 point .485" broach - Crane, Symmons. 15 point broach - Santec, Savoy, Wolverine. 16 point .360" broach - Gerber, Sayco. 16 point .370" broach - Acme, American Standard Cadet & Colony, Barnes, Burlington, Central Brass, Concinnity, Eljer, Glauber, Harden, Kohler Trand, Milwaukee, Newport, Phylrich, Royal Brass, Scoville. 16 point .40" broach - Sterling. 17 point broach - American Brass, Mansfield, Midcor, Phoenix, Streamway. 18 point broach - Briggs, Indiana Brass, Union Brass. 20 point .285" broach - Broadway, Concinnity, Danfoss, Dornbracht, Eljer, Grohe, Jado, Kohler, Milwaukee, Paul. 20 point .415" broach - Broadway, Speakman, T & S Brass. 22 point .375" broach - American Standard old 3/8". 22 point .438" broach - American Standard current 7/16". 38 point broach - Import, Pegasus, Glacier Bay. D Broach - Delta, Milwaukee, Universal Rundle, Valley. Oval Broach - Delta, Moen, Mixet. If you have a 16 point .370" Central Brass stem broach and you need a set of handles for that faucet. You can choose from all of the handles in that catagory. You will only have to change the handle screws to make them work. Use the search navigator to locate your parts easily. Just type in the part manufacturer name or OEM part number. ORDER, SHIPPING OR TECHNICAL QUESTION? SEND US A EMAIL WITH A PICTURE AND MEASUREMENTS OF THE PART TO faucetpartsplus@gmail.com OR GIVE US A CALL (405) 990-9997. MONDAY-FRIDAY AND LEAVE A MESSAGE. ORDERS WILL TAKE VARIOUS PROCESSING TIMES FROM 1-3 DAYS.